In this second installment of the “No Boundaries” series, we show how a long-known vulnerability in browsers’ built-in password managers is abused by third-party scripts for tracking on more than a thousand sites. 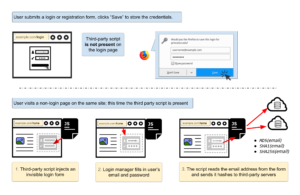 We show how third-party scripts exploit browsers’ built-in login managers (also called password managers) to retrieve and exfiltrate user identifiers without user awareness. To the best of our knowledge, our research is the first to show that login managers are being abused by third-party scripts for the purposes of web tracking. The underlying vulnerability of login managers to credential theft has been known for years. Much of the past discussion has focused on password exfiltration by malicious scripts through cross-site scripting (XSS) attacks. Fortunately, we haven’t found password theft on the 50,000 sites that we analyzed. Instead, we found tracking scripts embedded by the first party abusing the same technique to extract emails addresses for building tracking identifiers. How have In-Flight Web Page Modification Practices Changed over the Past Ten Years? When we browse the web, there are many parties and organizations that can see which websites we visit, because they sit on the path between web clients (our computers and mobile devices), and the web servers hosting the sites we request. Most obviously, Internet Service Providers (ISPs) are responsible for transmitting our web traffic, but reports (e.g. , , ) have shown that they may also inject ads into users’ requested web pages to increase revenue. Other parties may also intercept our web traffic for a wide variety of reasons: content-distribution networks (or CDNs) receive requests for websites that are geographically farther away to speed up response time, enterprise software and programs running on our devices may check incoming websites for added security or privacy before passing the website to our browser, and malicious adversaries may attempt to inject malware into requested web content before we receive it. In 2007, a research group at the University of Washington conducted a study to measure how often these web page modifications occur in practice, and to determine who is responsible for the modifications. Web page modifications were identified using a small piece of software embedded in a test web page, a so-called “web tripwire”, that compared a known good representation of the web page with the version of the test web page users saw in their browsers. The researchers then attributed the modifications to ISPs, malicious attackers, and client software such as ad blockers, using IP addresses and by finding identifying keywords in the injected web content. They found that only about 1.3% of participating web clients saw page modifications. But much about how we interact with and browse the web has changed over the past ten years. More specifically, with the emergence of mobile technologies and new network parties such as CDNs, it is important to learn if and how these new developments have affected in-flight modification practices. We invite you to take part in our research study. Following the same setup as the UW study, we have created a test web page containing a “web tripwire”. If it detects any in-flight page modifications in our test page, it sends us a copy of the modified version of our web page that your browser received. We minimize the information that we collect to detect page modifications. In addition to page modification data, we only record information that web servers normally record, such as IP address, browser type, date and time of page request, and a cookie to differentiate between users. We will permanently remove any personal information found in the page modifications before sending the modification data to our servers. By participating in this study, you are helping us gather information crucial for guiding research and building tools to improve web privacy. If you’re willing to contribute to our study, it’s as simple as visiting our test web page: http://stormship.cs.princeton.edu. If possible, we also ask you to visit our page through multiple different devices and browsers, as this will help diversify our collected data. Our test page contains more details about our study, and we will post our results there when we have completed our measurements. with any questions, concerns, or feedback. We greatly appreciate your help in our efforts to improve web privacy! Network neutrality prevents broadband Internet service providers from micromanaging our lives online. Constraining the networks this way enables and even empowers Internet users to be active and productive human beings rather than passive consumers. Unfortunately, the network neutrality debate is so polarized that neither side sees the full picture. On one side, opponents of net neutrality view the Federal Communication Commission’s 2015 Open Internet order as “heavy-handed government regulation” that excessively meddles with broadband Internet Service Providers like Verizon and Comcast. Opponents are looking at a fun house mirror. Despite their repeated false claims that the government will micromanage the Internet through burdensome price regulation, the Open Internet Order only constrains micromanagement by broadband Internet Service Providers. Opponents ignore—if not intentionally distort—the concentrated private power of ISPs, while grossly exaggerating the scope and impact of the FCC’s actual rules. On the other side, net neutrality advocates see the FCC’s intervention as light regulation that levels the playing field for edge providers—big content companies like Google and Netflix that deliver services to consumers from the edge of the network. Advocates worry that such providers can be squeezed out if ISPs discriminate in favor of their own programming or affiliates—think about on-demand television versus streaming television services, for example. While net neutrality proponents push for the right policy, they aren’t making the strongest case possible and often concede too much ground. In their rush to protect content providers, they shoot themselves in the foot by perpetuating the mythical division between edge providers and ordinary end-users, thus seeming to forget that everyone online is exchanging content. We’re all content providers. Everything that occurs on the Internet is an exchange of data between end-users. That’s the beauty of the Internet. It opens the door widely for all of us to create, socialize, innovate, and possibly become the next Google or Wikipedia. Unfortunately, advocate distortion diminishes who we are, who we can be, and the social goods we can create by reductively portraying most of us as passive content consumers. What they don’t get or sufficiently highlight is that the infrastructure of the Internet profoundly impacts what we believe is important, true, and worth pursuing throughout all aspects of our lives. Net Neutrality is a reflection of how society answers three fundamental political questions: Who decides what you do? Who decides who you communicate, transact, and collaborate with? Who decides how you should live your life? To see what we mean, first consider how indispensable the Internet is for participating in modern life and how deeply it influences the ways we think and act, work and play. Beyond the growth in electronic commerce and innovations that were unimaginable only two decades ago, the Internet has radically increased entrepreneurship, political discourse, the production and consumption of media, social network formation, and community building. Indeed, the Internet provides and shapes essential opportunities for individuals, firms, households, and other organizations to interact with each other. The Internet hasn’t just reconfigured our lived-in environments and transformed capitalism. It’s re-engineered our world. Next, consider how net neutrality is fundamentally about social control. The social value of the Internet is attributable to its openness, originally enshrined in end-to-end architecture and subsequently protected by the technical difficulties ISPs faced in figuring out who was doing what online in real-time with sufficient accuracy to exercise control over their activities. Over the past two decades, ISPs invested in developing the technical capability to monitor data streams and develop actionable intelligence that allows them to manage traffic. Keep in mind that “traffic management” is a euphemism for surveillance and control. As with any infrastructure system, some control by ISPs is inevitable and desirable. “Network neutrality” only prevents broadband Internet service providers from using intelligence about end-users and uses (who’s doing what online) to exercise control through the specific means of blocking, throttling, and paid prioritization of data packets. It leaves untouched conventional means for managing congestion, such as congestion pricing, that do not rely on who’s doing what online and instead rely on the timing and quantity of traffic flows. Clarification: Conventional congestion pricing that is practiced in other sectors and is well understood in economics does not require discrimination based on use or user and is not in any way precluded by the network neutrality rules. There are reasons we don’t see it much on the Internet, but the reasons are not legal constraints. For the past decade, the FCC has struggled to create legal constraints that stand in for the disappearing technical limitations on ISP control. Every time the FCC succeeded, ISPs fought back and challenged the rules. Network neutrality opponents fear that network neutrality rules will lead to price regulation. But those fears are unfounded. Most recently, the FCC’s 2015 Open Internet order reclassified broadband Internet access service as a telecommunications service subject to common carrier regulation under Title II of the Telecommunication Act. Title II lays the foundation for potentially restrictive government regulation, including [cue the scary, dramatic music: dah, dah, dah] price regulation. Fortunately, the FCC exercised substantial forbearance when enacting the Open Internet order. It only sought to solidify the basic principles that it has strongly supported since 2004 and that have been reflected in its previous policy statement, enforcement actions, merger conditions, and 2010 rules. Price regulation is not and has not ever been a feature of network neutrality. Still, the phantom of regulatory creep—that the FCC would use its authority to go beyond network neutrality, implement price controls, and take over the Internet—lurks and scares the hell out of conservatives, even though such expansion would never happen in our contemporary political climate. In reality, network neutrality in general, and the 2015 Open Internet Order in particular, aim to prevent Broadband Internet service providers from micromanaging what we do online. As we extend Internet-connected sensors to other infrastructures—transportation and electricity—and into other spaces—cities, workplaces, and homes—society will need to grapple with how to govern intelligence and intelligence-enabled control. Frankly, if we can’t get network neutrality for the Internet, it’s hard to imagine we’ll get it for the other, high-stakes intelligence-enabled control systems we’re building. * Brett M. Frischmann, Charles Widger Endowed University Professor in Law, Business and Economics, Villanova University, and Evan Selinger, Professor of Philosophy at Rochester Institute of Technology are co-authors of Re-Engineering Humanity, Cambridge University Press: forthcoming in April 2018.